This 3-disc set completes Pizarro’s complete cycle of Rachmaninov’s solo piano music. It has already been swiftly followed by a box of 7 CDs bringing this issue together with its two predecessors to offer the intégrale in one unit. This third volume maintains the high standards of playing and recording found in volumes one and two. As an individual issue it is a little less satisfactory, since discs one and three offer respectively the transcriptions of his own and other composers’ music and mostly smaller earlier pieces from the 1880s. The middle disc is the thing here, with the mighty Sonata No.1 and the first set of Etudes-tableaux. Not that those outer discs do not have their charms. The transcriptions are often close to Lisztian ‘paraphrases’ where the result contains as much of the arranger as of the original composer. They serve too as a reminder of Rachmaninov the recitalist since they appeared on so many of his concert programmes, and he recorded several of them, sometimes more than once. Pizarro in every case is a bit slower than Rachmaninov’s own timings, but not significantly so. Neither pianist seeks to draw them out and suggest more significance than they can bear, and it is always fun to hear what a skilled virtuoso can do with Flight of the Bumblebee or the Scherzo from Mendelssohn’s A Midsummer Night’s Dream. Pizarro’s technique enables him to deliver very satisfying performances of such showpieces, without being merely glitzy. The most significant of these arrangements is that of the composer’s own early orchestral Suite in D minor, thought lost until rediscovered in 2002, when a previously unattributed piano solo work could then be seen to be a transcription of it. Ekaterina Litvintseva recorded it for Profil on a disc of early solo Rachmaninov issued in 2015, which I have not heard. Its four movements are a valuable addition to the repertoire, offering some fascinating glimpses of what the young composer would go on to achieve. Artur Pizarro plays it with complete conviction, as if it really belongs in this oeuvre. The apprentice works on disc three have something of the same attraction, a peep into the workshop of a teenage prodigy, already on the threshold of mastery. 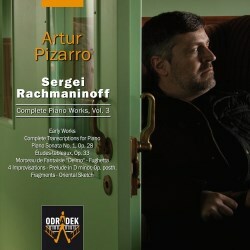 No one work here perhaps is absolutely essential Rachmaninov, but most are charmingly lyrical and make enjoyable listening, especially when played with the sensitivity and poetic feeling Pizarro brings to them. He really does come to the Russian with as much reverence as he brings to late Beethoven. The First Sonata benefits from that same seriousness of intention, and Pizarro makes it sound as if it is one of the great sonatas for solo piano, which indeed it is. As ever, he is never in a hurry, as his time of over 42 minutes suggests. Thus he lays out the three ideas of the first movement’s exposition with great care and deliberation, as if important things are being said; the work has a literary background in Goethe’s Faust. The meno mosso theme, a locus classicus of Rachmaninov’s ability to evoke deep nostalgia with a few chords, has a wonderful bitter-sweetness played in this manner. The ensuing extensive chant-like subject with its repeated notes is hauntingly characterised also, as it is on its climactic return later in the movement. The slow movement has all the innocence of Goethe’s Gretchen at the outset, and its increasing emotional complications are dramatically conveyed. The finale in Pizarro’s hands has a steady tempo, so that we experience cumulative power rather than headlong intoxication, and inexorable rather than irresistible rhythmic drive. If you like a Rachmaninov finale to generate a pianistic firestorm then Weissenberg is still the record holder for most notes to the minute, taking a mere 11:35 to Pizarro’s 16:33. Pizarro’s probing conception is quite different throughout, and has its own validity. The Etudes-tableaux Op.33 are just as satisfying here, if more central in interpretation. Pizarro is irresistibly insouciant in the syncopations of first of them, swaggering across the bar-line, and inimitable elsewhere in evoking those lyrical moments half-hidden in the figuration. The issue is not quite a persuasive standalone offering, as the notes on the music are available only in the first volume of the series, and the discs are even through-numbered so that CDs 1-3 here are numbered ‘V, VI and VII’. The assumption is that you already have the earlier issues. If you do and have enjoyed those earlier ones, you will find this essential. If you don’t you might want to obtain the complete box of 7 CDs rather than this collection with its mainly ‘mopping-up’ contents list. Since the transcription of the orchestral suite was not available to Howard Shelley (Hyperion), it makes Odradek’s complete survey the fullest of all, with one important proviso; Shelley includes both versions of the Sonata No.2, whereas Pizarro offers only the second shortened version. That is the one most often heard, but cuts in Rachmaninov, even his own, involve losses as well as gains. That apart, this series is comprehensive, beautifully recorded, and very consistent in approach, with virtuosity aplenty but always in the service of a serious vision of what this great composer has to tell us.